Please click here for the calendar of upcoming youth events. 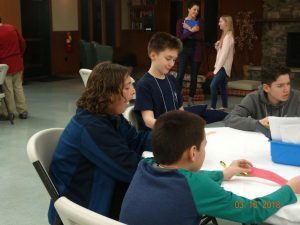 A retreat for youth in grades 6-8 What is New Beginnings? 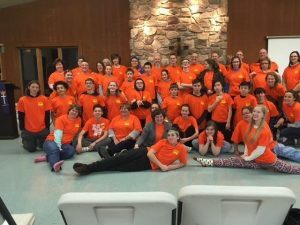 “New Beginnings” is a unique ministry in the Diocese of Central PA that shares the love of Christ with the middle school-aged youth of today. Throughout the retreat weekend, the high school youth will minister to the middle school youth. “New Beginnings” speaks, listens, and challenges middle school youth to be positive about themselves, their friends, families and their communities, in a critical time in their lives. This ministry reminds them that we are all children of God, we are special, we are loved, and there is nothing that we cannot overcome with Christ. Who can go to New Beginnings? Anyone in grades 6-8 may attend. You can attend the weekend as many times as you want during these years. When is New Beginnings? The “New Beginnings” check-in begins at 6 pm on Friday, April 5th and continues through a special Eucharist at 11 am on Sunday the 7th. (The entire weekend concludes around 12 noon). Activities include a series of songs, skits, movie clips, and small group discussions. Topics such as God’s love, prayer, self, friends, parents, siblings, and school is explored with talks introduced by the high school youth and adult members of the team. New Beginnings #2 is Friday, April 5, 2019 – Sunday, April 7, 2019. Where is New Beginnings? 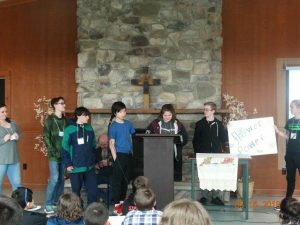 Camp Mount Luther, just outside of Mifflinburg, PA How much does New Beginnings cost? Only $100.00 per participant! That includes housing in cabins with other youth, all meals, a t-shirt and an entire weekend of activities! How do I register for New Beginnings? Click here to register. In order to prepare materials for the retreat, the registration deadline is March 29, 2019 What do I need to bring with me when I come to New Beginnings? After your registration has been sent in and accepted, you will receive a few additional forms to fill out along with a packing list for the weekend. What if I have more questions? Please feel free to email or call Mary Ellen Kilp or Theda Tallman at cpayouthcom@gmail.com or 717-475-2785. Click here for a flyer for New Beginnings #2 for more information. Click here for a list of what to bring on a youth event. Colorado Youth leadership Initiative: register for 2019 Leadership training for youth and for more information, click here. To get a schedule of additional upcoming youth activities, please click here. Sponsoring and collaborating with congregations to hold programs and events. The Cross-Generational Team of the Stevenson School for Ministry is ready to help and support the development of children, youth, and young adult ministry. For more information, click here. Applications are now being accepted for The official Youth Presence at the Episcopal Church General Convention 2018 click here for more information. The youth committee of the diocese is presently being chaired by Mary Ellen Kilp, and Theda Tallman who are always ready to support and engage youth and parents. For more information contact them at cpayouthcom@gmail.com The Cross-Generational Team of the Stevenson School for Ministry is ready to help and support the development of children, youth and young adult ministry. Click here for more information. Check out these family resources for Lent by clicking here.